activity of biopsy specimen with AMA RUT is performed straight up to endoscopy procedure. AMA RUT is a biochemical method that determines a high urease activity of H.pylori bacteria in the stomach biopsies. Determination of urease activity in biopsy is based on the color change of the indicator in the medium alkalization with ammonia, formed by hydrolysis of urea. Urease activity of H.pylori is so high that manifests itself not only in pure culture, but also in biopsies of gastric mucosa. —one test-slides in the pack. — ten test-slides in the pack. — twenty-one test-slides in the pack. Remove the protective coating from the test-slide. During endoscopy take biopsies specimen from the stomach lining. Put a biopsy specimen on a slide. Determine the color change around the biopsy on the slide. If the color of the spot remains yellow, the test is negative. If the color of the spot is blue, the test is positive. The higher the urease activity of H.pylori is, the quicker does the spot appear and the bigger it is. See also the complete instruction. Unlike most of the rapid urease tests, AMA RUT detects the urease that is present in the biopsy specimen at the time it is taken, not the urease that can be produced hours later. Thus, saving time on incubation, AMA RUT also provides better specificity compared to most of the gel-based rapid urease tests. Being a standart for rapid urease test in Russia for over 10 years, AMA RUT proved to be highly sensitive (93%) and specific (95%). Extensive clinical testings held in Moscow, St.-Petersburg and other Russian cities have proved that AMA RUT is an accurate point-of-care test. AMA meets the requirements of the In-vitro Diagnostics Directive 98/79/EC and AMA RUT is of f icially registered in European Community. notice, because it differs from the color of the biopsy specimen. 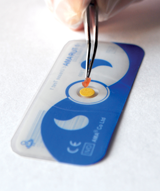 The same biopsy specimen can be examined with other methods directly after the 3-minutes period. The specimen can then be taken for further analysis, such as culture, histology etc. Shelf-life is 24 months. No special storage conditions are required.